Near my home there is a public square. Like most squares around the world ours is home to a resident population of pigeons. Fat ones that live off the muffin crusts and bread thrown to them by passers-by. I never did understand why people feed flying rats, but Mary Poppins has been right about so many things there must be some benefit to feeding the birds. For a long time I didn’t take much notice of this population. Sure I ducked when the flock rose over my head (you never can tell when they will drop a “gift” on your head), but they didn’t hold my attention very often until recently. What changed? 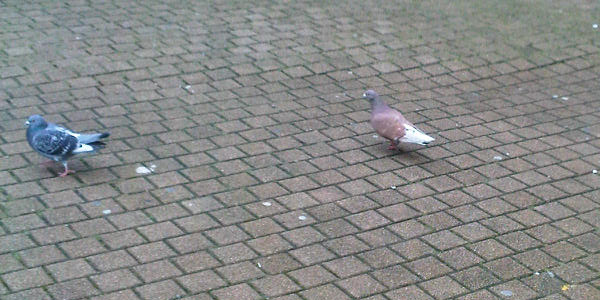 Well this season I noticed that there was a new type of pigeon in town; pink ones. I can already hear the disbelieving gasps (as soon as one holds still I will post a photo as proof), but it is true. Most of the pigeons in the flock are the standard blue/gray/white combination, but they have been joined by several of varying shades of pink. At first this occurrence was puzzling to me. Were these new additions escapees from a local breeder of exotic pigeons? Were they a spray-painted prank? But then it dawned one me, as I stood staring for a socially inappropriate amount of time, that there was another explanation…the pigeons were not an import…they had developed their pink feathers (hats off to Mr. Darwin) to blend into their surroundings. Again, I hear disbelief coming on. Understandable as you may not know that the paving stones that line our public square are a lovely shade of well…pink. More a dark brown mixed with terra cotta really, but the birds do blend in quite nicely. My theory has not yet been confirmed. To my knowledge no studies have been done on our pink pigeon population, but if I am right Mr. Darwin will have further evidence for his theories and I will see more pink pigeons next year. Right or wrong the pigeons made me think; they inspired me and that is all I ask of most days. Thanks pigeon population the next muffin crust is on me. Change over time is inevitable. How we deal with change within our lifetime can directly effect our personal success and happiness. But how a species deals with change over time can effect the success of the entire population. Our world is changing as we speak. Will humans evolve to adapt? Will those evolutionary changes be enough for our new environment? Consider an environmental change that is going on right now. Global warming, increased radiation due to a holes in the ozone and rising sea water levels are the ones that leap to my mind, but it could be anything. Now imagine how in say 1000, 0r 10,000 years humans may have evolved to deal with these changes. Set a timer and spend thirty minutes exploring the topic. Happy writing.